Kinesis is an innovative and unique system that focuses on movement through balance, flexibility, and strength. Kinesis burns 30% more calories than a regular workout. It’s a multi plane and synergistic workout program for your entire system of muscles and body balance. Kinesis allows the user to move through multiple directions of motion simulating real life movement to improve the quality of those movements in your everyday life. In one session you get a cardio workout, a full body resistance workout with a flexibility and balance workout – all the components of fitness in one, amazing session. Programs harmonize the ancient and the modern fitness arts, with health science as a guiding foundation. 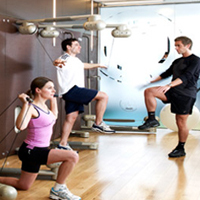 Users of all fitness levels and backgrounds can benefit from Kinesis. Those looking to burn calories while toning up will find that training on Kinesis engages more muscle groups than traditional strength training, resulting in more calories burned. OrthoSport Physical Therapy offers Kinesis at our Henderson clinic.